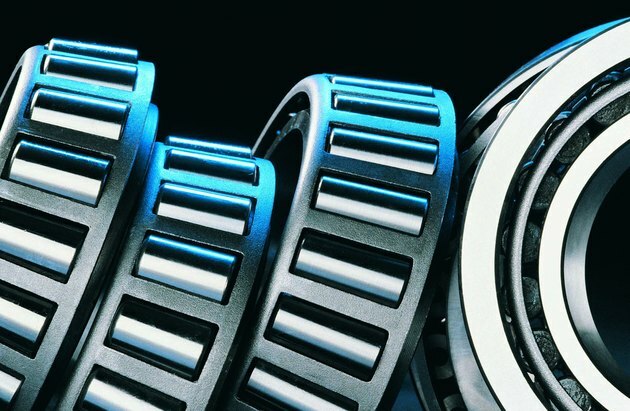 Bearings are used in a variety of applications, including in cars, agriculture, sporting goods, construction or any item that needs to rotate, pivot or slide in a variety of directions. Bearings are usually made out of metal or a composite material and typically require a certain amount of lubrication to move properly. While oil specifically designed for bearings is available for purchase, you can also make temporary bearing oil with some household products. Bearing lubricant is the best item to use if possible. Find a silicone-based lubricant for the best results. Water-based lubricants will work for a short time, but will eventually dry out the bearings and may damage them. If you're mystified about finding a silicone-based lubricant around the house, note that many personal hygiene lubricants are silicone-based. While bearing oil is always best for lubricating bearings, another possible household item to moisturize bearings in a pinch is mineral oil. Mineral oil can be found in many beauty and baby items, such as baby oil. There are also some after-shower mineral oils and skin-healing ointments that contain mineral oil. Check the ingredient list first before using on your bearings. If you still can't find a suitable product to lubricate the bearings, check around for some sewing machine oil. You can also head out to the garage and find potential lubricant sources there, such as bicycle chain lubricant or a few drops of motor oil. Before you apply your homemade lubricant to the bearings, remember to clean the bearings well. Again, while bearing-specific cleaner is best, there are several household items that will help clean bearings well, such as nail polish remover with acetone or rubbing alcohol. Clean the bearings well to remove dirt and debris before you put on lubricant to avoid simply smearing around the dust and dirt.